The ankle joint is a hinge between the tibia (shin bone) and the talus (ankle bone). It allows up and down movement. The fibula bone lies on the outside of the joint. The ankle has to bear 5 to 7 times the body weight during day to day activities, such as standing and walking. Below the ankle is the sub-talar joint. 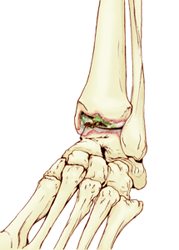 The subtalar joint, between the talus and heel bone (calcaneus) allows side to side movement. Pain: Pain is the commonest and most troublesome symptom. This is usually made worse by walking. It may disturb sleep. Simple ways to see if your pain is getting worse is to record whether your walking distance is decreasing, or whether you need more painkillers to ease the pain. Stiffness: With osteoarthritis stiffness, or reduced movement, is common. With inflammatory arthritis stiffness can often be worse first thing in the morning. Cracking/popping: There may be little pieces of loose cartilage or bone caught within the joint causing this sensation. Giving Way: This may be due to looseness of the ligaments, or secondary to pain. Swelling: Swelling may be a result of extra bone, or fluid within the joint. The soft tissues can also inflame and swell. How is Ankle Arthritis Investigated? X-Rays of the ankle are taken whilst you are standing. This simple test will give the most information on whether the ankle is worn or not. Blood tests are sometimes used to investigate inflammation, or gout. Occasionally special tests are needed to determine the extent of the arthritis, or exactly which joint is involved. An MRI scan can give a lot of information on the thickness of the cartilage lining the joint, and whether there are small areas of wear and loose cartilage. CT and bone scans may also be used to investigate ankle arthritis. Arthroscopy is an operation, (there is a separate sheet regarding this subject) which allows the surgeon to see the amount of wear within the joint. Arthroscopy can sometimes be used to washout the joint, and help in the treatment of arthritis. With any form of arthritis there are two forms of treatment. The first is without an operation, and the second is with surgery. Most arthritis can be treated without surgery, and only in severe arthritis will surgery be considered. In the first instance simple modifications of the way you lead your life should be tried. These include resting when the pain necessitates, slowing down and altering sporting activities. Weight loss, supportive boots and walking sticks are also useful. Splintage or bracing can sometimes help. The most important and effective non-operative treatment is weight loss. For many people the arthritis can be controlled by support of the ankle. Supports take 2 forms. Ankle braces, which can be bought from many sports shops. These may be bandages, lace up braces, or even individualized plastic braces that can be made for your leg. These braces can be hot and cumbersome and so HIGH TOPPED, LACE UP boots with a cushioned sole should be tried. Elasticated boots do not give such good support. Painkillers such as Paracetamol can be effective. Non-steroidal anti-inflammatories (NSAID), such as Brufen, Ibuprofen and Diclofenac can reduce inflammation. Patients need to check with their general practitioner or pharmacist that NSAID’s are suitable for them, as they can have side effects, especially if you have asthma, or stomach ulcers. Dietary supplementation with Chrondroitin and Glucosamine, which can be bought in health food shops, may be effective in some patients with early disease. Physiotherapy and hydrotherapy can help with pain and stiffness.